Our most popular handheld shape in a fabulous new Scottish Tweed with leather trim. This tweed is from Johnstons of Elgin in the north of Scotland. 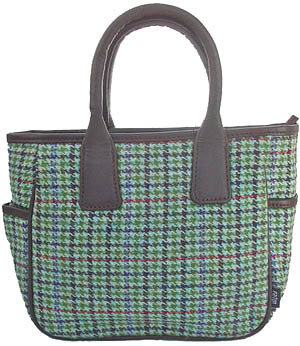 It is in a soft turquoise colour with a purple, red and green check, trimmed with brown calf leather. The lining is a brown grosgrain fabric with a zip pocket, key clip and phone pocket inside. The bag has a top zip opening and 2 side pockets on the outside.